TOP has played a critical role in securing and sustaining the Jewish future of Central Florida's Jewish community. Now, in our fourth decade, we endeavor to serve all Jewish communities seeking robust investment oversight, white-glove service, pro-Israel and anti-terror investment approaches, and a personal relationship with the legacy that is created through Jewish philanthropy. 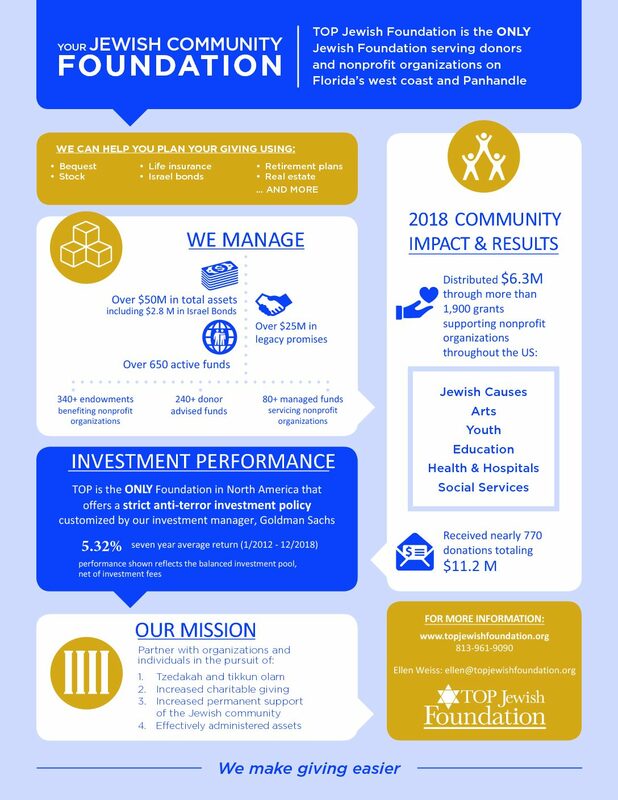 Founded in 1980, TOP (Tampa Orlando Pinellas) Jewish Foundation adeptly manages over 700 funds for families, couples, organizations, and individuals with the goal of enhancing the charitable experience while ensuring our Jewish future. With a values-driven model, we continue to grow and develop, now serving communities outside our original core locale. Getting involved with the TOP Jewish Foundation is like having your own family foundation with less cost and more convenience. Our motto is “We make giving easier,” and we are here to help you pursue your philanthropic dreams. If you’re already giving $10,000 or more to charity each year, having a conversation with TOP will help you manage your giving and make your giving go farther. TOP will help you design your philanthropy to help the community and benefit you. Short-term giving options let you take the tax benefit of your giving immediately, and long-term planned giving can help you make sense of how to use tools like life insurance or endowments to really make a difference over time while still minimizing taxes.